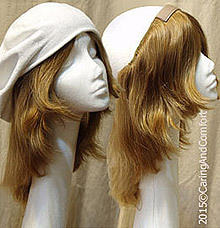 When you don't want to wear a wig - This is the perfect solution for giving the illusion of hair under a bandanna or a hat. Just attach the piece of Velcro to bandanna or hat, and your AURA Custom Bandanna Fall will be secure all day or night. A combination of the finest hand-selected materials, expert craftsmanship assure you years of pleasure from your AURA Custom Bandanna Fall. If any additional hair is needed it will be 100% Natural European human hair.